Decorating for Easter is fun. After the darkness of winter, it's a joy to lighten things up! I'm so pleased with it! Here's how I did it. First, I downloaded the art from one of my favorite blogs, Dear Lillie. Jennifer at Dear Lillie is a wonderful artist, and she offers downloads for sale as well as free downloads. This one is a quotation from Matthew 23. If you don't already know Jenni, then stop right now and visit her at Dear Lillie. You'll be so glad you did. Jenni has talent just oozing from her pores, and she's so kind and generous. I'm proud to know her. The art I used for this piece can be found here. 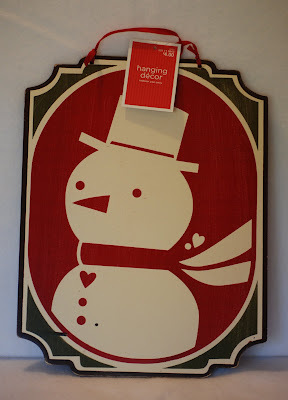 Then I simply cut out my free art in a shape I liked, Mod-Podged the art onto the plaque, and added a piece of twine for a hanger. Super-easy! I'm hanging this on the door of my mother's dough cabinet, which is a favorite spot for holiday decor. As you can see, I still need to decorate the tabletop on the cabinet. The cabinet is filled with things that remind me of my mother and my grandmother. It makes me happy to decorate it for each holiday. Now to work on the rest of my Easter decorations! Have you decorated for Easter yet? **I'm linking to the Tutorials and Tips Party at Home Stories A to Z and Tutorial Tuesday at Hope Studios. Richella I love it! I need to make a few quick and easy crafts to spring up our house! We don't have much up right now, and time is running out! 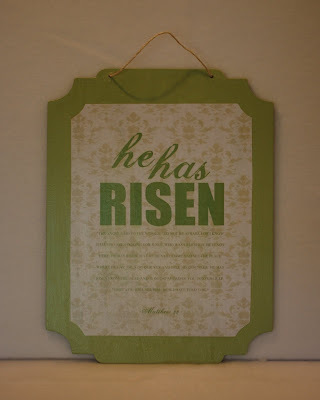 I love your Easter sign, such a beautiful reminder. You had the perfect board to put it on! You are so gifted with crafts, Richella. We're still celebrating St. Patrick's Day. I haven't had time to think of Easter, and most of the decorations bother me because they are commercially, not religiously, oriented. I had to trash everything I had last year so I may just choose to decorate for spring instead. Richella the sign is absolutely beautiful and tastefully done. I always enjoy viewing your home decor. I do need to add a few Easter touches this week. Thank you for your gracious comments. I've been meaning to come by sooner sweet friend. I love this and think it looks great on your mother's cabinet. I've never visited Dear Lillie and will have to do so soon. My house has Easter sprinkled all over!